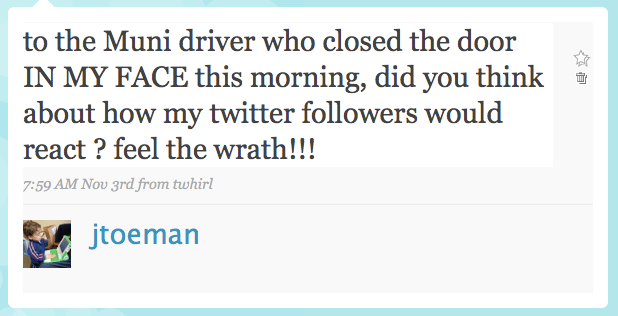 Guess how much attention the following tweet garnered from MUNI (the San Francisco transportation organization)? Answer below. A lot of bloggers worked each other into a bit of a tizzy this weekend as they debated the merits of a Twitter feature that would allow one to sort search results in the order of users who have the most followers. The debate wasn’t really about the feature itself, which is completely innocuous conceptually (Twitter search should allow tons of different sorts). The debate was about Loic Lemeur (the original poster) using the term “authority” to define his request. I’ll be as blunt as possible: the number of online “followers” (including Facebook friends, blog subscribers, and all the 19-year-olds on Friendster who genuinely want to meet old dorks like me) one has is not a measure of authority. It is not a measure of power. It is not a measure of intelligence. It is not a measure of capability. It is not a measure of quality. It is a measure of reach/audience, and if one wants to put a label on it, it’s called “popularity”. In high school I ran for class president. I lost. The winner went to all the cool parties all year long, I went to few. The winner was on lots of teams and associations, I was on several. During our speeches, the winner talked about how great the school was and how much pride she had. I spoke about getting the class to volunteer with a local in-need youth group. In truth, little of this all mattered in the election, since I wasn’t a very popular kid in high school (yeah, that’s right, the guy who programmed C++ and ran an online BBS in the late 80’s wasn’t super popular, can you believe it? have no fear, I blossomed). Here’s why I’ve been saying for the past year that it is far more important who you follow than who follows you: if you follow people just to get followers you’ll end up being overworked, deep in information overload, and superficial to boot. You won’t have a philosophy. It +will+ show. You might be able to fool most of the idiots most of the time, but eventually they’ll see the difference between the “collect follower” types and the “surround yourself with smart people” types like Tim O’Reilly or Jay Rosen. I can smell the “follow me” types a million miles away, can’t you? I’m an idealist at heart. Ideally one wouldn’t even be aware of quantity of followers. Ideally one wouldn’t know their blog subscriber count. Personally, my favorite “stat” is seeing responsive blog posts externally or comments on my blog posts and/or friendfeed entries. Comments imply I’ve done something interesting enough that someone else chose to interact with it. And that’s what excites me about being a content creator online. ps – the question at the top of the blog post was rhetorical, sorry about my clever ruse. I totally agree with you. There have been many times when someone has followed me and I’ve looked and seen that they have over 2000 followers and then I look at their feed and see crap. Those are the people that I don’t follow. I may only have numbers in the high 100s on my counts. But, I know that those people, for the most part, are people that I will actually gain something from. Yeah, you hit the nail on the head regarding “popularity” – and that popularity will also very by niche, something we’re not categorized by on Twitter. Someone who’s a popular YouTube celeb, musician, or online shoe store, doesn’t necessarily mean they have any “authority” in the topics I discuss. Some stats or rankings can be useful, but I recently stopped pointing my RSS feed to Feedburner. The number doesn’t really mean anything – it doesn’t inform my blogging and I don’t see a point in displaying the count as a badge. Thanks Jeremy. This is the first post that I’ve seen that made sense of it all. I found the earlier responses unusually irrational and filled with emotion not fully understanding what was behind the scenes (though I assumed something was!). Frankly I got pretty uncomfortable with how quickly people would pass around ‘idiot’ and ‘stupid’ instead of trying to push for a reasonable and logical discussion. I don’t think that behavior is positive for anyone’s readers, but I’m glad to better understand it through your post. Thanks! And I agreed. The important elements are conversation, discovery and influence. The third piece comes from having a track record of the first two. …I will get a free latte.